It’s rained here almost all summer, so since we had a sunny day, we decided to have a barbecue party. After looking through the McCormick Grillerhood recipes, the Grilled Lemon Pepper Herb Shrimp Kabobs caught my eye. 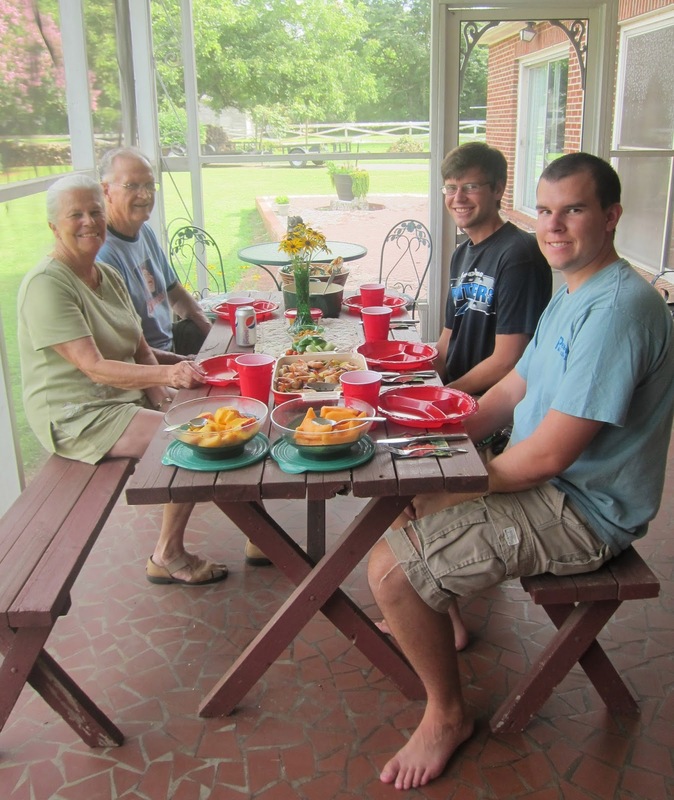 Everyone in the family loves shrimp, and we don’t get it very often as we’re not real close the coast. My son went into town and was able to find a couple of pounds. The boys and I also picked fresh garden vegetables. 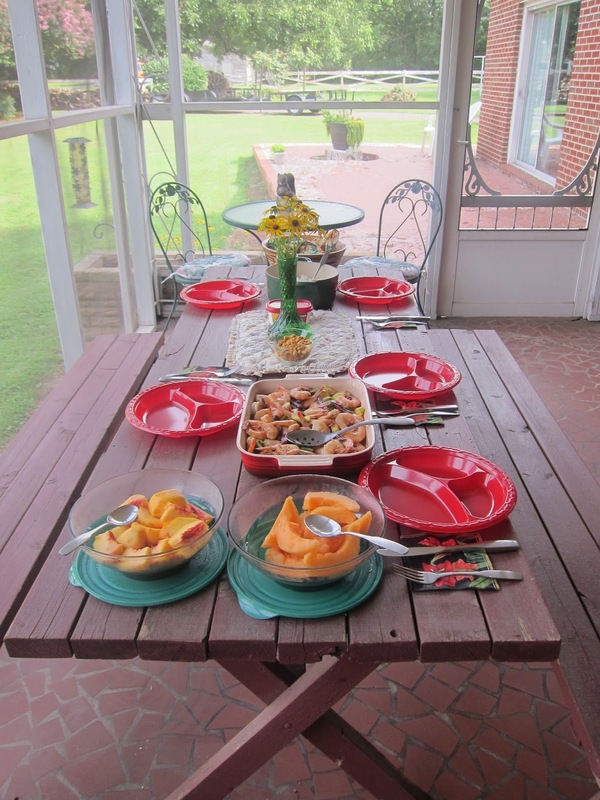 We had green peppers, squash, and red beans ready. The recipe calls for a mix of vegetables. We enjoyed our combination, but I’m sure there are loads of combos that would be great with the shrimp. This recipe is super easy. 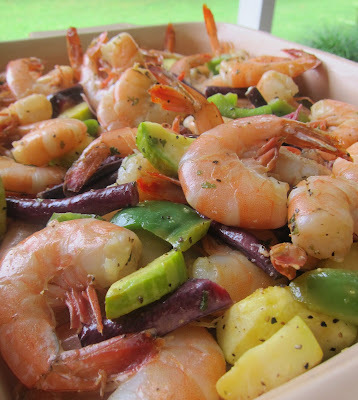 All we had to do was marinate the shrimp and vegetables with some olive oil and McCormick Grill Mates Lemon Pepper with Herbs. We just loaded up a zip lock bag and shook to coat the vegetables and shrimp. Super simple. I used a small gas grill tonight and added some pecan wood chips in an aluminum foil cup. 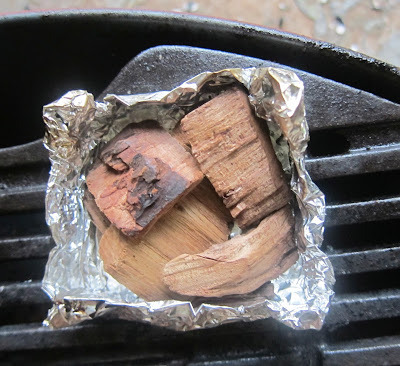 You just make your own little cup to hold the wood chips and add some extra smoke flavor to the grilled food. That was placed under the edge of the grill wok. Using wood chips for flavor is just one of the many great tips from the McCormick Flavor Forecast. 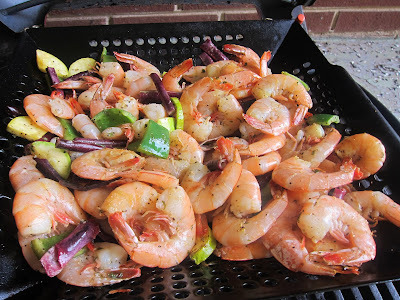 This is actually a kabob recipe, but I find it so much easier to use a grill wok for a party that I did my shrimp in my wok. You get the same flavor. It’s just quicker and easier if you’re grilling for several people. The shrimp and vegetables came out just right. I did stir a few times to make sure everything was grilled evenly. The end result was shrimp and veggies with some tasty crusting from the lemon pepper and herbs. We set up for the party. In addition to the McCormick shrimp dish, I made a pot of rice as a bed for the shrimp/vegetables and cut up fresh British melon from our garden and peaches from a local stand. Sweet potato rolls rounded out the meal. The shrimp recipe made quite a statement served in a colorful dish, and everyone was hurrying to get the drinks poured so that the McCormick party could start. As you can see, I did not have to ring a dinner bell to get the crowd out to the picnic table. Everyone was looking forward to digging in. 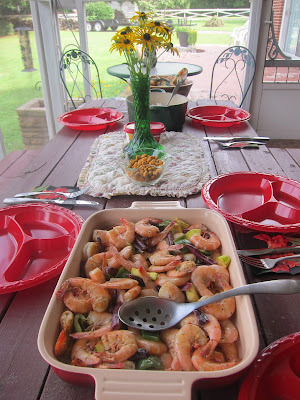 The shrimp and vegetables were awesome. The McCormick Lemon Pepper with Herbs was perfect with shrimp. It’s hard to beat some lemon flavor with seafood. The pepper gave it a little extra zip, and the subtle herbs just brought it all together. We pretty well cleaned the table out. There was a little rice left over that a certain puppy was thrilled to get as a treat. If you’ve not tried out Grill Mates by McCormick, they have some really awesome flavors to spice up your grilling. It’s also helpful to have the McCormick Grill Mates Facebook page which features a ton of delicious recipes and has search functions to find just what you have on your mind when the grilling urge hits you. *Please note that I’m a paid ambassador for McCormick this summer and that I got some seasonings for free (but purchased the McCormick Lemon Pepper Herb out of pocket). As always I do give my honest thoughts and opinions.